« Indulge in Wine and Chocolate Because You Can. This is it. 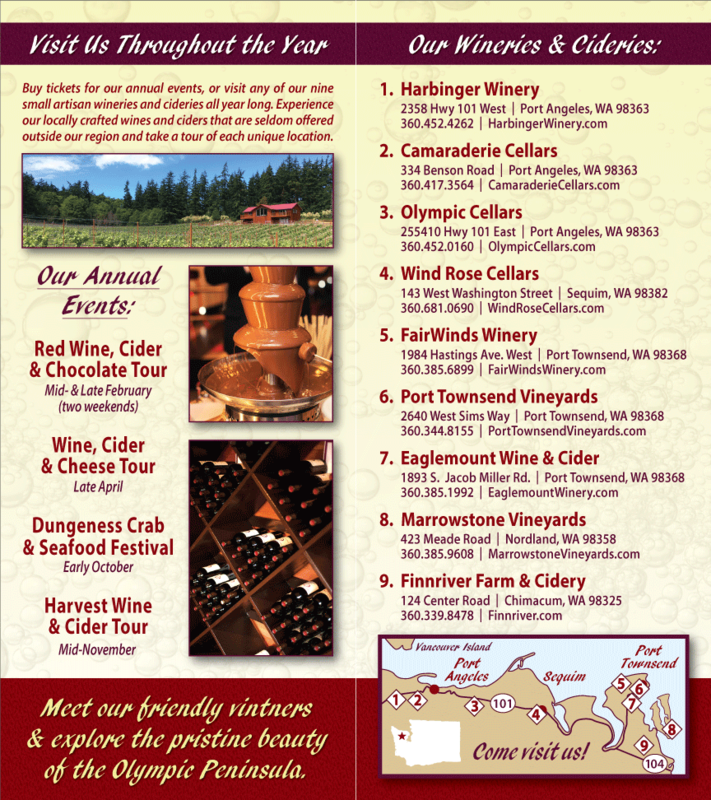 This weekend, February 12 and 13, 2011, is the start of the Red Wine and Chocolate Tour at Washington State Wineries on the Olympic Peninsula. Read on to learn what a few wineries will be serving. Sorensen Cellars in Port Townsend is serving handmade chocolate salami by Jennifer Michele (it has to be tasted to be believed) with Mt. Townsend Creamery’s Cirrus. Sorenson’s 2007 Malbec is the perfect match. Eaglemount Wine and Cider, near Port Townsend, will pour Syrah, Osprey (a Merlot based Bordeaux blend), and Raptor (a Cabernet Sauvignon based Bordeaux blend). Chocolate will be provided by local Chocolatier Jennifer Michele. Harbinger Winery in Port Angeles is releasing two new wines and a new beer this weekend. Stop by for a taste of the 2008 Bolero (a Tempranillo/Grenache blend), Raspberry Bliss, with locally grown berries, and a Venezuelan Chocolate Porter. This will also be the place to try, undoubtedly for the first time in your life, chocolate-dipped potato chips with a Dynamo Red reduction sauce. Also on the serving table will be bite-sized “Pain au chocolates”, served with an award winning Syrah; dark chocolate cake topped with a caramel and sea salt drizzle will be served with the 2008 Bolero. If you happen to be traveling with children, they will be thrilled by the non-alcohol alternative to Washington State Wines: the organic “killer” Mexican hot chocolate. At Olympic Cellars in Port Angeles, all wines will be poured. Local chocolatiers Yvonne Yakota and Jim Queen will be on hand, serving hand-made chocolates alongside specially selected pours. Live music is sure to encourage dancing! The Red Wine and Chocolate Tour continues next weekend, too, February 19, 20, 21, 2011. For more information, please see Washington Wineries Events.